i can’t believe people are actually trying to find ways to make him not be a terrorist. 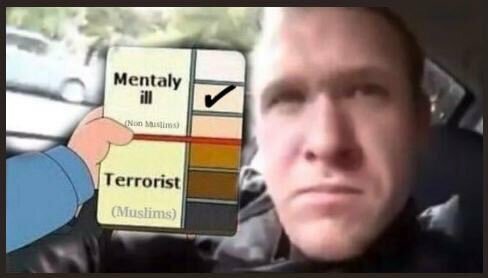 he IS a terrorist and that’s a FACT. He live streamed it, he shot a young man in the face when he tried to run at him to protect others and he shot old people and emptied his gun on them like 4 times.He killed 49 PEOPLE. That wasn’t just a mass shooting, it was a TERRORIST ATTACK caused by a WHITE MAN.